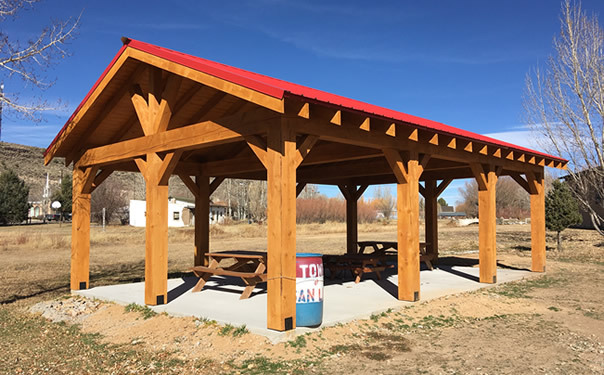 Park Pavillion, November, 2017 — The Town of San Luis, Adelante San Luis and Costilla County are pleased to announce the addition of a new 20’ x 30’ red-roofed pavilion at San Luis Community Park. In the spring of 2018 there will be an addition of three new picnic tables and two barbeques. All thanks to a grant from The Colorado Trust, Adelante, and The Town of San Luis. Also, a big thank you goes out to Costilla County for their land clearing and concrete work. We couldn’t have finished the project without the county's help. The fences will be painted in the spring to match the new Kaboom playground equipment. The pavilion is free to the public to use and enjoy. If you want to reserve the pavilion for a large groups or events please call Town Hall at 672-3321 for more information. 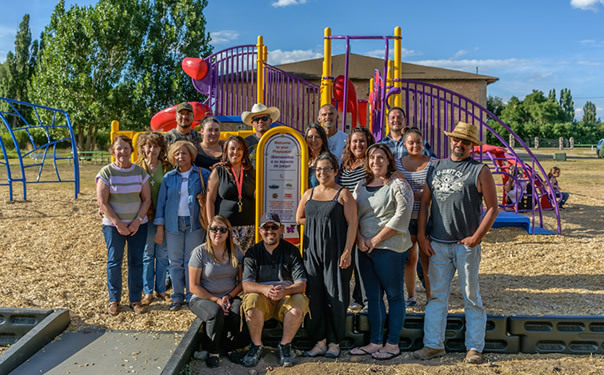 August 2016—KaBOOM a non-profit organization, has helped create a great place for our San Luis children to play. KaBOOM inspires communities promote and support play in the lives of children who would otherwise not have the means to afford the play spaces they deserve. KaBOOM! Looks for sponsors of the grant within the applicant’s state. Thus, the Colorado Health Foundation chose the Town of San Luis to be awarded a Kaboom! Playground. 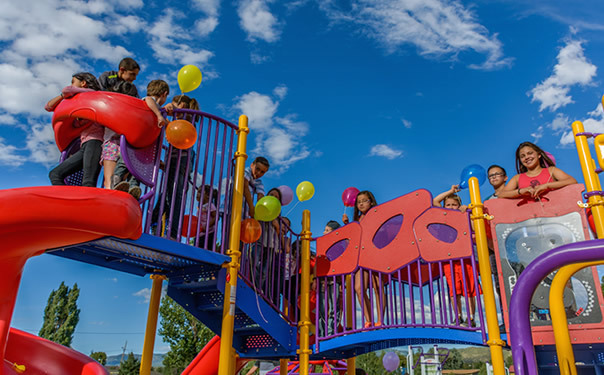 The San Luis playground is the 4th one built in collaboration with the Colorado Health Foundation, whose goal is the make Colorado the healthiest state in the nation by insuring that all Colorado kids are fit and healthy. So under canopy of cloudy skies and ample sunshine, over 200 residents of the communities of the Rio Culebra Village (and volunteers with roots in the community) come together as united powerhouse to build a playground for their children and grandchildren. Over 200 volunteers shoveled wood chips, screwed in play components, mixed cement, did carpentry work, cooked hamburgers and hotdogs, breakfast burritos and played music all in the course of six hours. Without the KaBOOM team working with local community volunteers for seven weeks this momentous endeavor could not have been realized. Local volunteers worked diligently to make Build Day happen. So, kudos to the whole team, especially Dana Maesta—Grant Writer and Fundraiser.